Leicestershire (including Leicester but not including Rutland) has a theoretical entitlement (TE) to 9.48 seats. It forms a review area with Nottinghamshire, and for the time being I’m working on the basis that Melton district (TE 0.50) will form part of a cross-border seat. 1. Leicester has a TE of 2.85. 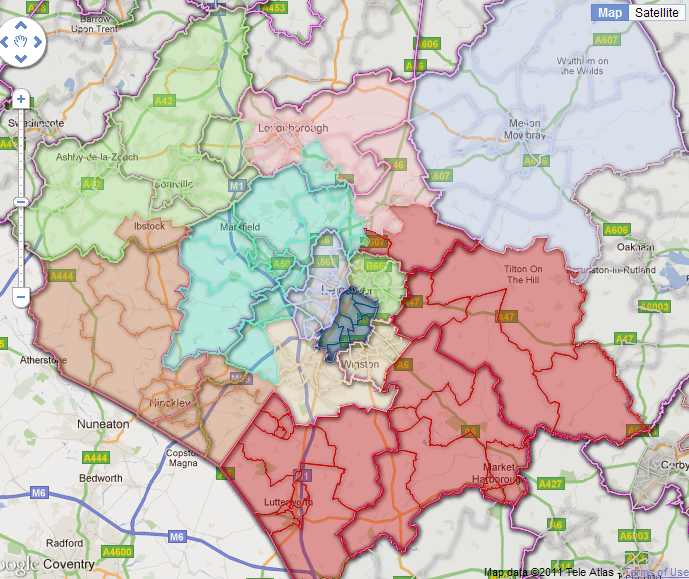 Which suburb should be added to the Leicester West constituency? Candidates: Braunstone 12,656 (TE 0.17), Birstall 9,872 (TE 0.13), Glenfield 7,812 (TE 0.10). 2. Should Shepshed be in the Loughborough or the NW Leics seat? 3. The combined TE of NW Leics and Hinckley & Bosworth is 2.03. Can they form a bloc? 4. Blaby district has an electorate of 73,026. Can it form a single seat “as is”? 5. Which neighbouring areas should the Harborough and Oadby & Wigston districts (TE 0.86 and 0.59 respectively) form a seat with? Now here’s the rub: it doesn’t matter what answers you give to any of these questions, you’re lucky if you can construct any plan at all that doesn’t split towns, divide neighbouring villages, smash districts to pieces, or conjoin areas with nothing in common. Well, you have to start somewhere and I start with Shepshed. This is my second attempt – this one has Shepshed in the Ashby seat.